A Question for all my Readers? I need you're help. As I'm getting more and more views, I want to make posts that you like to read. I feel like all I ever do is write about hauls, and that just gets pretty boring. So, here's what I need. You can leave it as a comment to this post or shoot me an email. Let me know what types of posts that are interesting to you. Whether it be more fotd or fotn looks, favorites, reviews, weight loss accomplishments and setbacks, collection posts, whatever. This would really help me know that I'm reaching someone out there. Up next should be Favorites of the month! Fact, I've been overweight almost all my life. Fact, I've been one every kind of fad diet one can think of. Well, in my mind I failed. Then, I think of what I have gained. With each pound lost, I feel better both physically and emotionally. This is what keeps me going from day to day. I have learned that yes, I am going to mess up. There is no overnight fix. Every time I get off the horse, I get back on again and keep trying. It all came full circle today, when I went to my monthly weigh in. The scales said I have lost 5 pounds this month. This is what keeps me going. So the time has come around yet again. It's time for Sephora's once a year online sale where everything is 20% off online. Many makeup enthusiasts like Moi wait all year for this sale. You need a code to get the discount which is FF2009. I have heard rumblings from various websites that Sephora is sending a mass email for V.IB. 's that has a printable coupon to take into stores. Until this is confirmed or not, to use the discount in store, one must know a Sephora "Cast Member" to partake. The sale starts today and runs through November 2nd. I have started making a preliminary list of things that I might purchase. I'm not buying everything on this list, because as you see it is rather long. If you have any of these items, please let me know if you like them or not. Yes, I know its a long list. Just trying to jot down things I have been wanting. I also have been wanting to try Illamasqua products, so I made sure to wait until FF to do so. Again, if you have any of these products let me know what you think. Here is a tag that I found on one of the blogs I read. I thought it would be interesting to do some posts about my life, and not just about makeup all the time. I thought this tag was very interesting, so I decided to give it a try. 3. What was the last film you saw at the cinema? Fame, it was great! 4. What is your favorite TV show? Grey's Anatomy. Although, I am still mad they killed off George. 12. What are your favorite clothes? Simple and Classic...Jeans and Tshirt. I love dressing jeans up for nigh time with accessories and shoes. Don't really wear skirts or dresses. 24. What did you want to be when you were little? 26. Are you a cat or dog person? Dog.. i love dogs!! 29. Been in a car accident? I've been in a fender bender. There ya have it, a look into life with me. Hope if you do this tag, you will link me to it so I can read or comment. Also, if anyone has any suggestions on topics you would like me to talk about feel free to drop be a comment or email. I feel that all I ever do is post about hauls and ins and outs. I want to diversify this blog. Suggestions are greatly appreciated. I mentioned in my Makeup Art Cosmetics collection haul that I was probably going back to get Violet Trance eyeshadow, and boy am I glad that I did. It is such a pretty color. Yes, it does take some work to get it to show up but I will make it work. As for Soft Brown it is in the regular line of colors. I see people on Specktra and Youtube all the time use this color to blend out the crease, and it does not disappoint. Its a new must have for me. 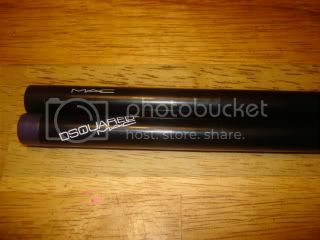 The Greasepaint sticks are a new limited edition product that MAC has released. I heard rave reviews about this product, so I knew that I would be purchasing at least one. I bought the black one first. 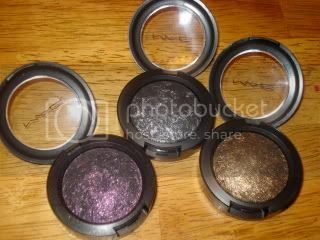 These can be used as a shadow base or as eyeliners. 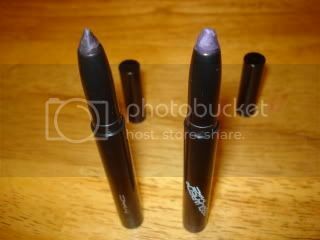 However, if used as an eyeliner they are not waterline safe. When used as a shadow base, it works really well. 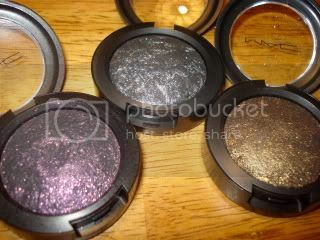 I used the purple one as a base for Young Punk eyeshadow, and it stayed all day. Once this baby dries it will not budge. It is sold out in a lot of places, so if you're thinking about getting one you may want to do it quick. I absolutely love this product. Both of these products are repromotes that have been released with previous collections. The 165 brush came out with the BBR collection last January. 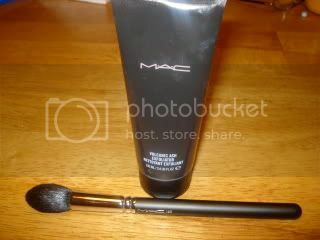 It is great for highlighting and contouring. It is so soft, and it seems like its gonna be a great brush. The Volcanic Ash was released with a collection that I can't remember the name of. I wasn't quite the MAC junkie back when this was released as I am now. Many people love this product, and I must say that it is pretty cool. The smell is something that I had to get used to, and to be completely honest I'm not sure I have yet. I only like this product because it makes my skin glowy. I'm slowly getting used to the smell, but at first I thought of returning it. The jury is still out on this one. Bat Black CCB was released with the Style Black collection. 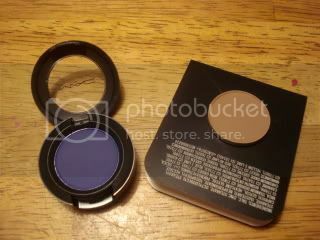 I have not used this product yet, but CCBs are meant to be worn on the eyes, lips or cheeks. Because this is a dark burgundy color, I'll probably just use it as a base for shadows. I saw a MAC artist that used it as a base for Young Punk and it looked spectacular. I also think it would go well with Sketch and Beauty Marked eyeshadows. Creme cup is from the regular line. 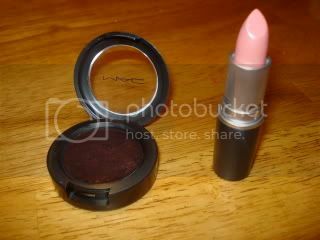 Some compare it to Angel lipstick and that is partly the reason why I bought it. Angel is a frost lipstick while Creme Cup is a cremesheen lipstick. Because frost lippies and I do not mix, I knew that this was the one that I wanted. I bought this primarily to copy Kim Kardashian's lipstick of choice. I am a big fan of her makeup looks, so I really wanted to try something similar. I used it today, and I really like it. It goes great with smokey eyes. Overall, I really liked everything that I purchased. I know it is a lot, but I did not buy all of this at one time. I was looking forward to this collection for a while, and I was very happy with it. I passed on the lippies for this collection, and that was because I just can't do darker colors. The advertisement images were lovely, but I just can't justify buying a black lipstick that I will never use. The dsqaured collection was awesome as well. I probably will not purchase any more items from the collection though. I am trying to save up for holiday, which is right around the corner. As for the things I bought, I must say my favorite of the bunch are the shadows. They are just too beautiful to pass up. Up next should be a look using the shadows. How have you all been? I know we're already out of September and into October but here is my new installment of Ins and Outs. Natural Makeup: It seems that lately, all I have been rocking makeup wise is foundation, blush, and mascara. With working in a school, dramatic makeup really doesn't work. Plus I like to sleep in, so this is usually my routine during the week. On those days when I do put on eyeshadow, I use a minimal amount. I think an upcoming post will be my everyday makeup look. Also, I'm thinking about doing day to night looks possibly. All of the Style Black Shadows: The Style Black collection was on my ins and outs list last time, and this was before the collection actually released. With seeing it in person, and getting my items this collection did not disappoint. 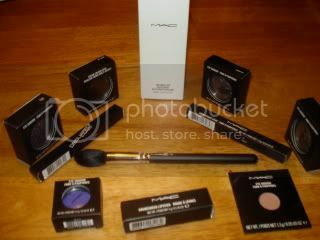 In fact, my next post will be a haul and review of Style Black. Hello Kitty Quad in Lucky Tom: On those days when I do use eyeshadow, this quad is what I reach for most. I use the lightest color Creme Royale on the lid and Paradisco in the crease. Add black eyeliner and mascara and that's it. Being sick: Working with the little one's isn't the best for you're immune system. This month I have spent over half of it with a cold. The kids are awesome, but when you teach preschoolers and kindergarteners, they don't know what covering your mouth means just yet. Anyways, their a joy to be around but sickness just comes with the job title. This takes me to my first out of the month. Exercise: Starting a diet regimen most always mean exercise. When I first started trying to change my eating habits, I was doing well. I would hit the gym 3-4 times a week, and now that I have started working and grad school I seem to never have time for it anymore. Add the fact that I've been sick, and you get not going to the gym for over a month. Somehow I have managed to keep off what I have lost, but I know that I'm not going to without getting back into the exercising bit. Ok, enough blabbering I will save that for another post.